Looking for an inexpensive simple way to put on your compression stockings? Determine your correct size in medical legwear and arm gauntlets to ensure comfort and correct fit. 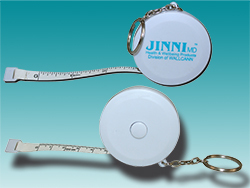 Buy the JINNI Measuring Tape Now! Simple easy glide assistance when putting on Compression Stockings or Arm Compression Garments. This item is machine washable and is made from a soft durable fabric. Buy the Easy Glide Donner Compression Stocking and Sock Aid Now! This item is popular with our customers for packing for holidays and for people who suffer from back pain. A simple, inexpensive aid to assist putting on a stocking or sock. Can be usde with Jinni MD stockings or socks. It consists of a strong, shaped, flexible plastic gutter with long cotton tapes attached to the top. The stocking or sock is fed on to the plastic and held in place with the side notches. The foot is put in the open end of the stocking, which is then pulled over the foot and up the leg using the tapes. Buy the Sock and Stocking Aid Now! Donning devices are designed to assist you in correctly applying Jinni compression stockings.Sturdy all steel construction, padded hand grips, height adjustable for maximum ease of use. Ideal for closed toe as well as open toe stockings and socks. 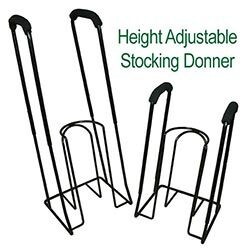 Buy the JINNI MD Stocking Donner Now! Flexible and moves with your body providing comfortable support for socks, stockings, and anti-embolism compression garments. Keep compression socks and stockings comfortably in place to give you support without sagging.This fixative washes off easily with water. 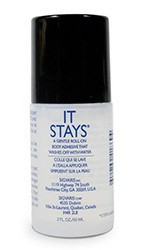 Buy IT STAYS - Roll On Fixative Now! Specially formulated compression washing solution for elastic and compression garments. Extend the life of your quality compression garments. Buy Compression Washing Solution Now! For further assistance Call 1300 799 455 or use our LIVE HELP facility.